Rishikesh, being the adventure capital has a plethora of activities ranging from bungee jumping, flying fox, to paintball and many others. However, it is most notable for being the hub of river rafting in the country. The city ensues a lot of participation from people from across the globe, who come here for a taste of an adventurous escapade. It can also be noted that many of these adventure activities, particularly river rafting, can be good means of fostering support among groups. This is why most of these activities can be effectively disguised as “team building sessions” as part of corporate training. Rafting involves teamwork that in turn entails different members working in tandem to keep the raft from flipping. It envisages the concept of uniting the “watertight” components into achieving a goal. This technique can thus be used to foster co-operation amongst various echelons of a corporate framework. 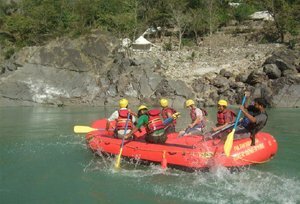 Trainers and experts can be requested to make corporate outings in Rishikesh, more effective. Trainers usually carry out a need assessment which is done with the help of a simple questionnaire. A questionnaire is the simplest means to study the processes in the company and the challenges faced by the team constitution. According to the findings of the survey, a corporate program is designed and transferred. The trainers thus ensure a better degree of ROI on employee engagement. Corporate Packages for Rishikesh Irrespective of whether it’s a brain storming seminar, a team building session, an annual meeting or anything of similar significance, Rishikesh boasts of being the perfect destination for a corporate session. Situated just about 250 Kilometres from a major corporate hub (Delhi-NCR), one can reach this city in about 6 hours by road. A trip to Rishikesh can be the perfect way to fuse business with pleasure and thus bring about complete mental and physical rejuvenation. 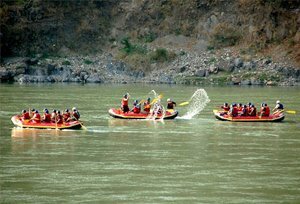 The rafting schedule has been devised in such a way, keeping in mind the busy and severely toll-taking corporate world. Arrive at the Alaknanda River Adventure Camp situated in Byasi. Upon your arrival, meet our representative and he will give a brief information about the rules and regulations of the camps followed by the camp allotment. Later, enjoy the hot buffet lunch and dine near the magnificent riverside. After the lunch, the representative will give vital information about the rafting techniques. Get ready for an enthralling rafting experience from the Alaknanda River Rafting Camp to Shivpuri where you will encounter rapids called three blind mice, cross fire, body surfing and Shivpuri rapids etc. The rafting expedition will end Shivpuri and later drive back to the camp. Upon your arrival in the camp, enjoy a hot cup of tea and coffee along with the snacks in the evening. Bonfire and dinner by riverside.Overnight stay at the tents. In the morning, we will give you wakeup call to freshen up and have the breakfast. After the breakfast, driveto Shivpuri, our river rafting starting point and raft up to the NIM beach (around 16 Kms rafting session).Navigate through the various rapids like the Wall, Three Blind Mice, Roller Coaster, Golf Course, Initiation andDouble Trouble. After the completion of the rafting session at the NIM Beach, return to the camp in the evening and take rest. Share the memorable experiences of your rafting trip with your friends with a refreshing hot cup of tea or coffee. Enjoy some snacks and bonfire. Dinner and relaxing overnight stay at the camp. The morning is completely to enjoy the leisure in whatever manner you may like. After the breakfast, leave the camp and move for your onward destination. Arrive at the Alaknanda River Adventure Camp situated in Byasi. Upon your arrival, meet our representative and he will give a brief information about the rules and regulations of the camps followed by the camp allotment. Later, enjoy the hot buffet lunch and dine near the magnificent riverside. After the lunch, the representative will give vital information about the rafting techniques. Get ready for an enthralling rafting experience from the Alaknanda River Rafting Camp to Shivpuri where you will encounter rapids called three blind mice, cross fire, body surfing and Shivpuri rapids etc. The rafting expedition will end Shivpuri and later drive back to the camp. Upon your arrival in the camp, enjoy a hot cup of tea and coffee along with the snacks in the evening. Bonfire and dinner by riverside. Overnight stay at the tents. In the morning, we will give you wakeup call to freshen up and will take you for adventure activities like rock climbing, rappelling. Enjoy breakfast at camp. After breakfast check out from the campsite to start journey for onward destination.